Welcome to Reische Performance Products! We are committed to producing the absolute best low temperature thermostats currently available for your Shelby GT500, GT350, Raptor, Mustang GT, Boss 302, Cobra, Bullitt, Lightning and EcoBoost F150. We manufacture thermostats for almost any Ford high performance application as well as build custom thermostats to your specifications. Lethal Performance Wins 5.0 Mustang Magazine's King Of The Street Competition! 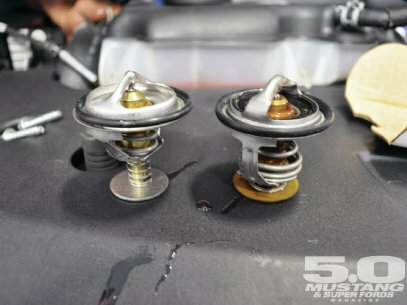 Our Ford-G5 Performance Thermostat was among some of the first mods to be done to Lethal's 1236hp Shelby GT500. 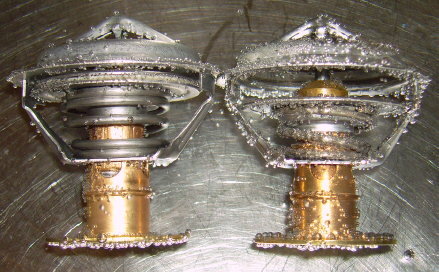 Many of the low temp thermostats available from our competitors use an improperly fitting bypass valve and will be unable to control the bypass flow, allowing hot coolant to recirculate back into the engine at all times, which reduces the efficiency of your cooling system. Our 170° Performance Thermostats are made with the same size diaphragm and bypass control as your OEM unit. Each is designed specifically to fit your application and made with 100% U.S. components. These thermostats will provide the best possible heat dissipation from your system along with a faster warm up time and better cold weather performance than a 160° unit. We believe the 170° opening temp is the ideal balance for high performance engines, providing high flow to your radiator by mid-180 temps along with good all season performance, giving those running high levels of timing and/or boost added protection against engine-damaging detonation as well as maximum horsepower. We believe these are the best available and back them with a 5 YEAR WARRANTY. 3.3/3.5/3.7/5.0/5.2L DOHC(RWD only), 2.7/3.0L EcoBoost(all): fits 2011-2018 Mustang & F150. Includes a new OEM O-ring. 4.6L DOHC (32V), 3.0/3.5/3.7L DOHC(transverse only): fits Taurus SHO, Cobra, Mach 1 & more. Includes a new OEM O-ring. 5.4/5.8L DOHC: fits 2007-2014 Shelby GT500 Mustang only. Includes a new OEM O-ring. 4.6/5.4/6.2/6.8L SOHC: fits Mustang, F150, Crown Vic & more. Includes a new OEM O-ring. Small block Chevy, big block Chevy, small block Ford, Chrysler, Pontiac, Buick & many other applications. 2.125 inch diameter non-bypass. ALL REISCHE PERFORMANCE THERMOSTATS ARE GUARANTEED AND WILL BE REPLACED FREE OF CHARGE IF A FAILURE OCCURS WITHIN FIVE YEARS OF YOUR ORIGINAL PURCHASE! MORE WAYS TO IMPROVE YOUR COOLING SYSTEM!